New Yorker staff writer Jane Mayer has a new book coming out, Dark Money, which chronicles the influence of a small handful of ultra-rich dynastic American families on US politics. Mayer pays especial attention to the Koch family, whose patriarch, Fred Koch, contracted to build an oil refinery for Nazi Germany that Hitler personally approved and "admired German discipline so much in the 1930s that he hired a fervent Nazi as a governess for his eldest boys." The biography also cites a sealed deposition from a 1982 court battle over the Koch fortune which allegedly reveals that Charles and David Koch blackmailed their eldest brother, Frederick, into stepping aside in the battle over inheritance by threatening to reveal to their father that he is gay. 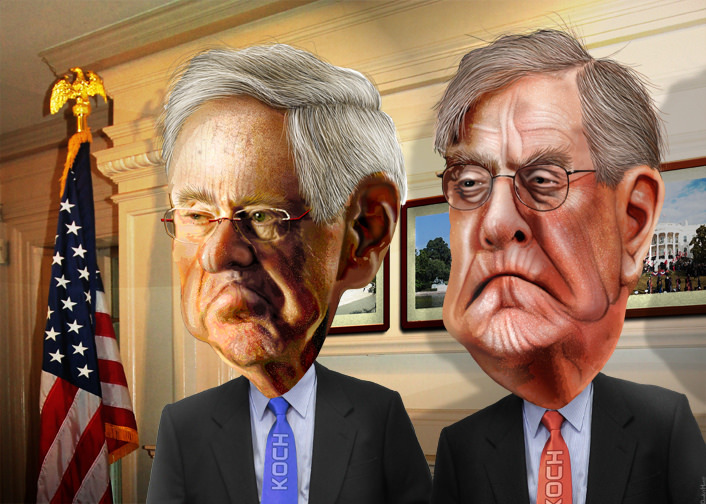 Of less salacious and broader significance is the way in which the Kochs rallied other super-rich families to a network of quiet, deadly effective political groups fronted by an octopus's nest of front-groups. Mayer describes this as a ploy to get other families to help foot the bill for the Koch's mission to strike down anti-pollution laws, and traces how this Gilded Age political phenomenon has grown over the years to today, serving as a major animating force behind the Tea Party and in opposition to any kind of socialized health insurance, including the watered-down Obamacare regime. Other biographers have described the senior Koch encouraging competition among the boys, including encouraging boxing matches between twins William and David. Mayer provides new details about the sad state of the sibling relationship as adults. A 1982 sealed deposition from Bill Koch, for example, describes Charles and David attempting to blackmail their eldest brother, Frederick, by threatening to reveal his alleged homosexual preferences to their father unless Frederick turned over his shares in the family business. The fraternal hostility, she writes, led to lawsuits, acrimony and a propensity to hire private investigators to unearth dirt on sibling rivals -- and other perceived enemies.